A concert, an evening at the opera or the theater–anyone of these may serve as a nice way to celebrate a special occasion. Sometimes, an especially memorable performance unexpectedly turns an enjoyable evening into a momentous one. Dining, however, either before the curtain rises or after it falls, can be problematic. ‘Before’ is too early for the dinner hour and anyway, dining too well might dull one’s pleasure in the performance. ‘After’ also has its drawbacks for audiences often leave the theater beyond the time at which restaurants and their kitchen staffs happily welcome new arrivals. Some restaurants do have after-theater menus, but your inclination or your budget might welcome another option. Here is the main course of a three-part menu for a supper at home, at the end of an entertaining evening. Everything may be prepared in advance and quickly reheated and/or arranged on plates. As a supper for two, it may be a fitting finale to a night of celebration. But if, for example, you are going out with house guests, all of the courses are easily adapted for larger numbers without adding significantly to either early or last minute preparations. Over this supper and a bottle of something nice, everyone, including the cook, can relax, relive the evening’s performance, and enjoy each other’s company. A Timing Suggestion: Hours in advance, the mâche may be washed, refreshed in ice water, dried, spread out on a cotton dish towel, rolled up in it and stored in the refrigerator. 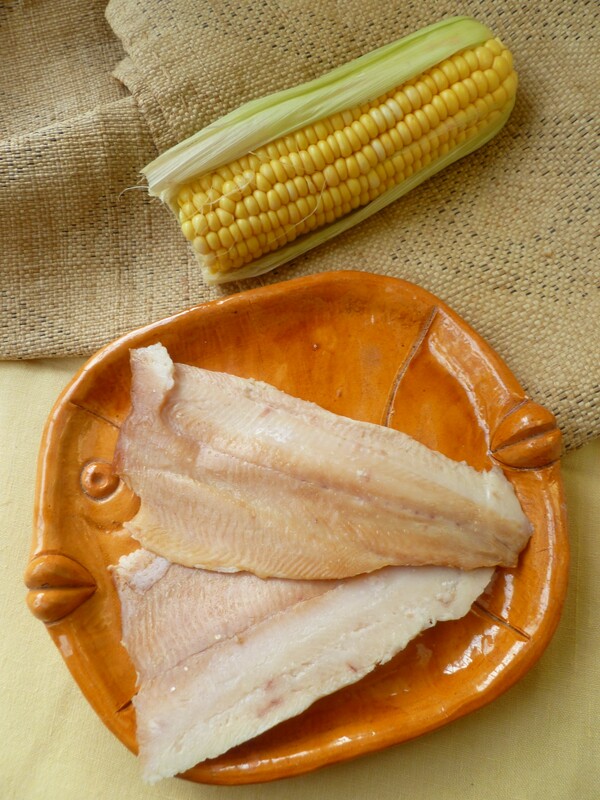 The corn may be cooked in advance and refrigerated and the tomatoes and green onion may also be chopped and stored separately in the refrigerator. The vinaigrette is also fine, stirred together ahead of time and set aside at room temperature until later in the evening. 2 cups of coarsely chopped Cherry Tomatoes: Yellow and red ones are used in the photographed salad. 2 cups of Mâche Salad Leaves (1/2 cup for each salad), washed, refreshed in ice water and dried: Roll the leaves up in a cotton dish towel and store them in the refrigerator if the salad is being put together later in the day or evening. 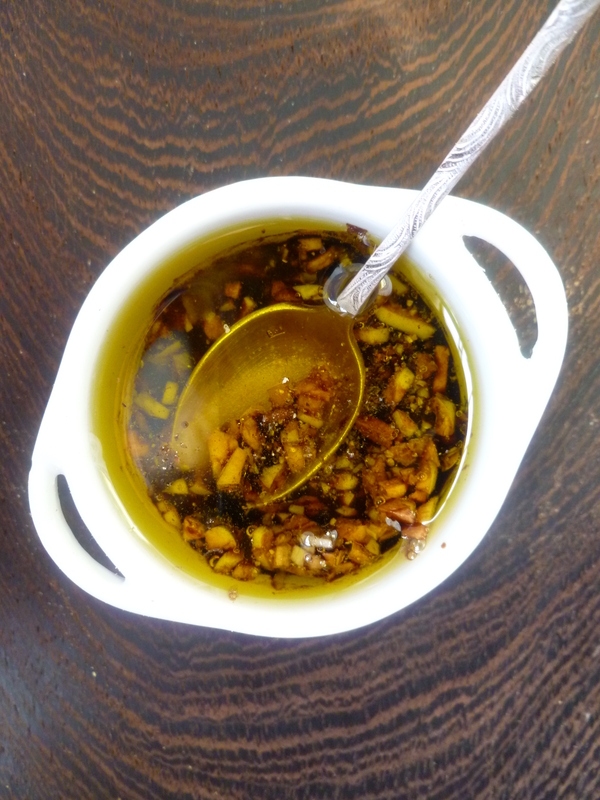 Garlic Vinaigrette: The recipe is below in Part II. Optional: In the Occasional Menu, An After Theater Supper, this salad is accompanied by small loaves of ciabatta and pepperoncini infused olive oil. 1. Husk the ears of corn and remove as much of the silk as possible. Stand an ear on end in the deep bowl and run a knife down the rows to remove the kernels, collecting them in the bowl. The kernels should be sliced off the cob, not removed whole. 2. Cook the corn in the pot of boiling water for 3 minutes, drain it, and refresh it in ice water. Drain it again and refrigerate it until time to mix the salad. 3. 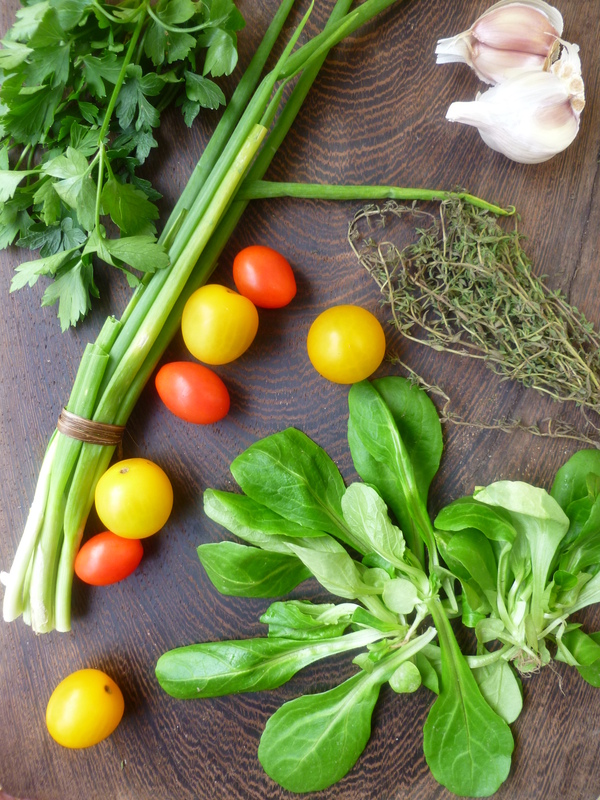 To mix the salad, combine in the salad bowl the corn, the green onion, the chopped tomatoes, capers, chopped parsley, and thyme leaves. Mix in 3 Tablespoons of the vinaigrette. 4. Divide the salad mixture among the salad plates. 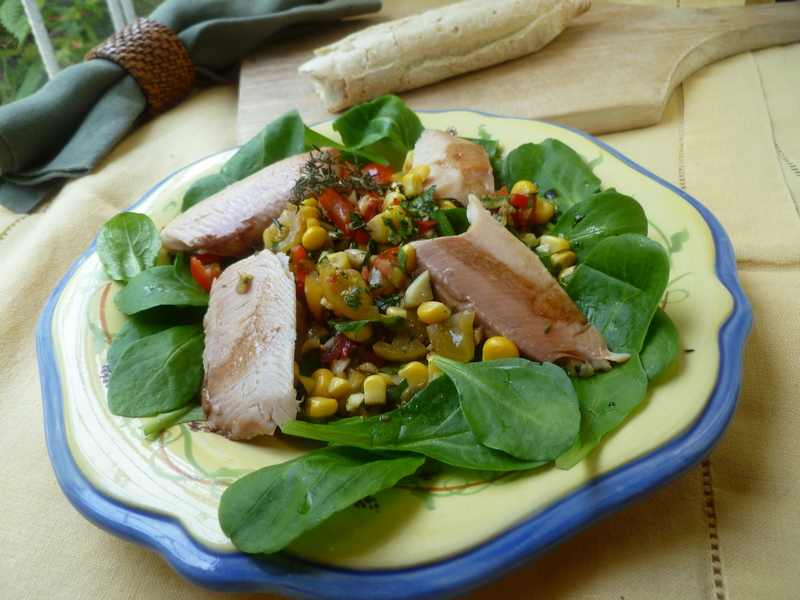 Arrange 1/2 cup of mâche leaves around each salad. 5. 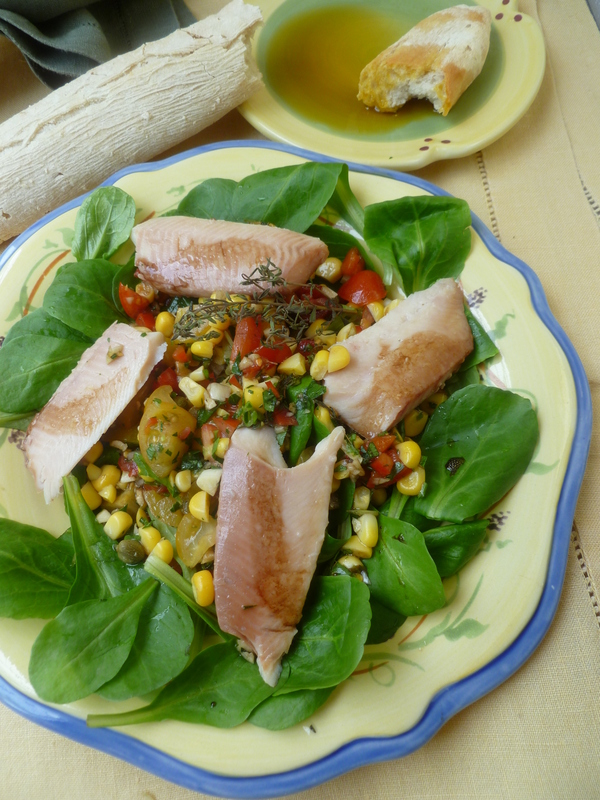 Arrange a fillet of smoked trout, divided into four pieces, on top of each salad. Dribble some vinaigrette over the pieces of trout and divide any remaining vinaigrette among the salads. Garnish each one with a branch of fresh thyme. 1. Whisk all the ingredients together in a small bowl and set the vinaigrette aside at room temperature, covered, until ready to make the salad and arrange it on plates. Whisk the vinaigrette once again before adding it to the salad and drizzling it over the trout fillets. 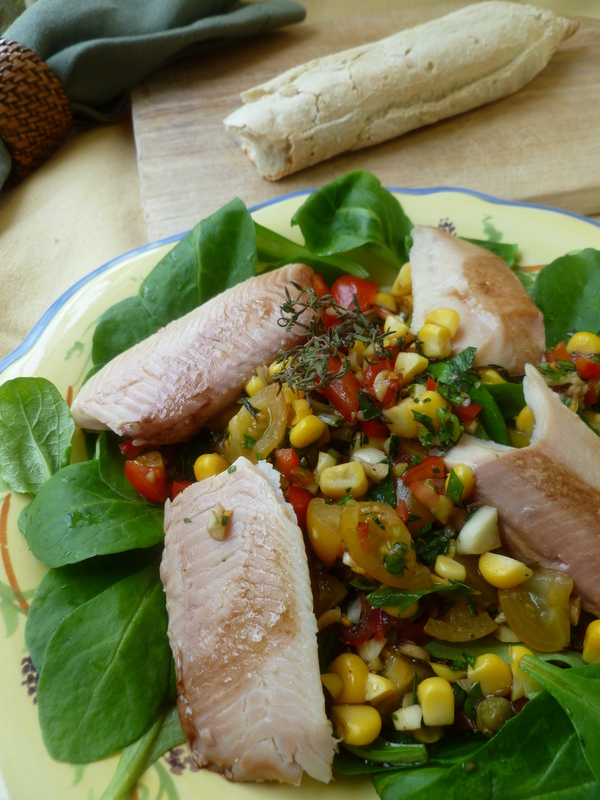 A Note: Salad of Fillet of Smoked Trout, Fresh Corn, Mâche, Tomato and Thyme with Balsamic and Garlic Vinaigrette is the Main Course of the Occasional Menu: An After- Theater Supper. The salad could also be served as a First Course by simply reducing the size of it. It would make a good Light Lunch Main Course, as well. How fresh and healthy! 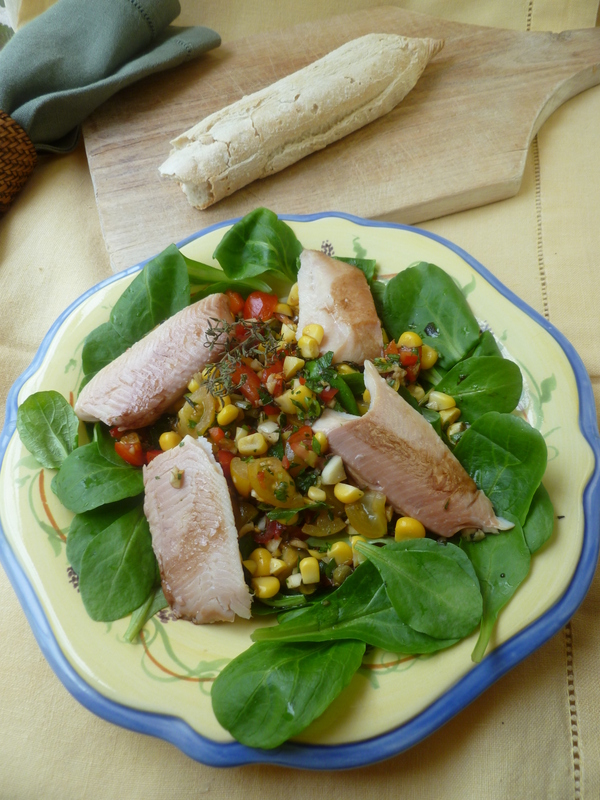 Your salad looks marvelous – the exact meal I would like to enjoy after a long day at work! Filling yet light and nutritious! Speaking of ‘fresh and healthy’ I enjoyed your post on how to choose a turkey. I like buying local and from small, individual-run businesses–like a good butcher shop or the sort of family farm you described. It’s always nice to read about the positive, hopeful trends in American food production.